Beneath the Rowan Tree: Waldorf Thursday :: Orange! 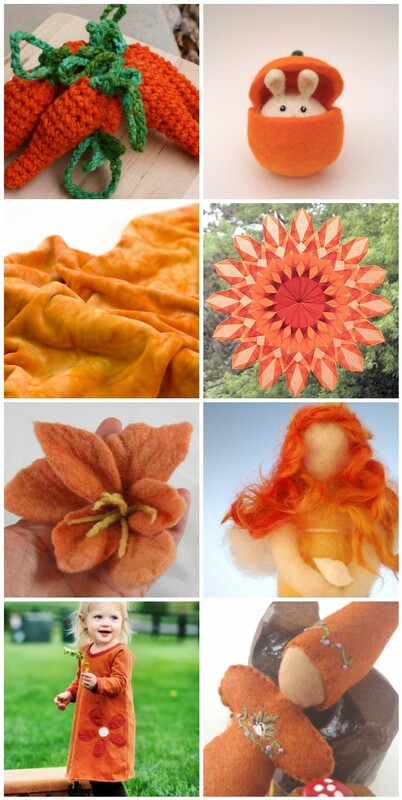 In Waldorf pedagogy the days of the week each have an associated colour, and the colour for Thursday is orange. Here are some great oranges to brighten the day and mark the season for your home, nature table or just for fun! I started my search with the Natural Kids Team and found all of these lovelies! 1. Carrots! by Fair Trade Family. 2. Bunny! by Fairy Folk. 3. Bamboo! by Tickety Bu. What a happy color for a gloomy rainy day! Thank you for finding my orange fairy! orange is my very favorite color. love it! Orange is my very favorite color too, it's so happy and energetic. I love it's vibrancy and the emotion it conveys. Lovely collection!